Am currently engaged in a couple of branding projects. As ever, client confidentiality prevents me from going into too many details. One job is for a line of French bread, and is really fun as I have never branded a food before. Branding is a bit of a dark art. Some brands, like Orange, have an abstract name, which at first glance has little to do with their product. This of course is okay if you have an enormous budget so you can create an awareness that Orange spells telecommunications. The name itself has lots of positive associations. It is bright, cheerful, colourful, has no rhyme and so is unique…, it is juicy and refreshing. And so on. Much better than calling it ABC telecommunications for example. In most cases, however, it is usually more approproate if the branding you come up with actually reflects something about the nature of the product. In my recent bread branding exercise, the suggested brands grew out of three attributes of the product: its authenticity, the mystery of traditional bread’s production, and its freshness of taste. My client seems to have chosen one route already (around authenticity), and with any luck it should be piloted in the shops soon. Quite looking forward to sauntering down a supermarket isle, and gesturing towards a bread product and being able to show off that its name, tagline, brand story and look and feel was my idea. The other project I am embarking on is to assess the ON TRACK publisher’s branding across its magazines, online and on concourse tactics. It has a name, but I want to get help refine how the business expresses itself and ensures that its brand expression is coherent. An interesting, albeit slightly Herculean task. But one which should bring all kinds of benefits: not least being that the range of ON TRACK offerings can be seen to be part of one product family, and complement and enhance each other. 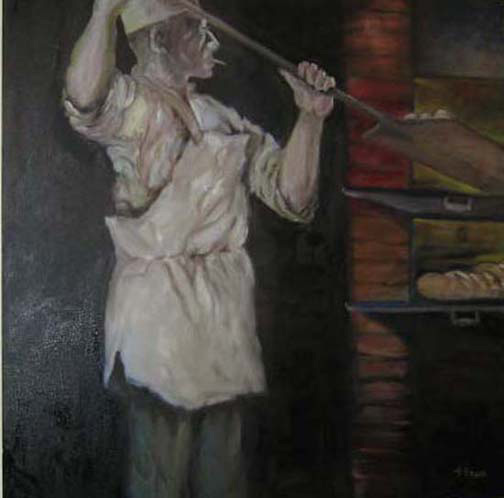 Below an image of a French baker I found after random googling from this site by artist Walter Stephen Krane. Had it on my computer as something to put me in the mood. Notice how the colours do the French flag too. This entry was posted in Uncategorized and tagged branding, bread, On Track, Orange, Walter Stephen Krane. Bookmark the permalink.